The SWIVEL is a forgiving all round board with a full plan shape for stability and easy paddling. Once up and riding the modern concaves and rails allow the board to perform like a modern short board. It has a single into double concave and the medium rails adds to the performance of the board. This model has a medium entry rocker making it suitable for most surf conditions. The board is ridden slightly longer and slightly wider than your normal dimensions. This board can handle small to overhead surf and is ridden by beginners through to advanced surfers. 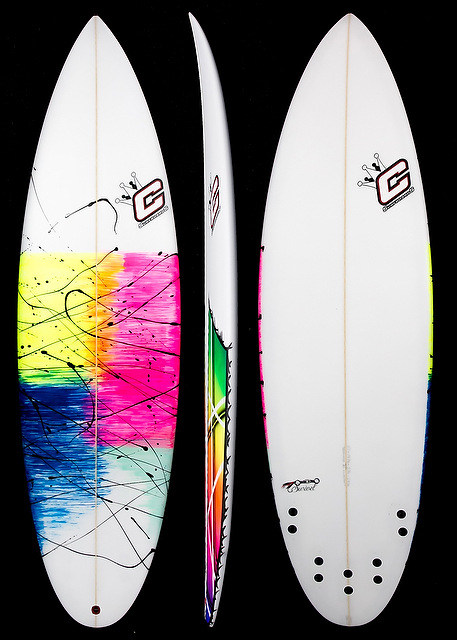 The model can be up sized for bigger surf and comes with a five fin set up as standard. This board belongs in your quiver if you are not often in the surf or require a little extra volume to assist without sacrificing performance.